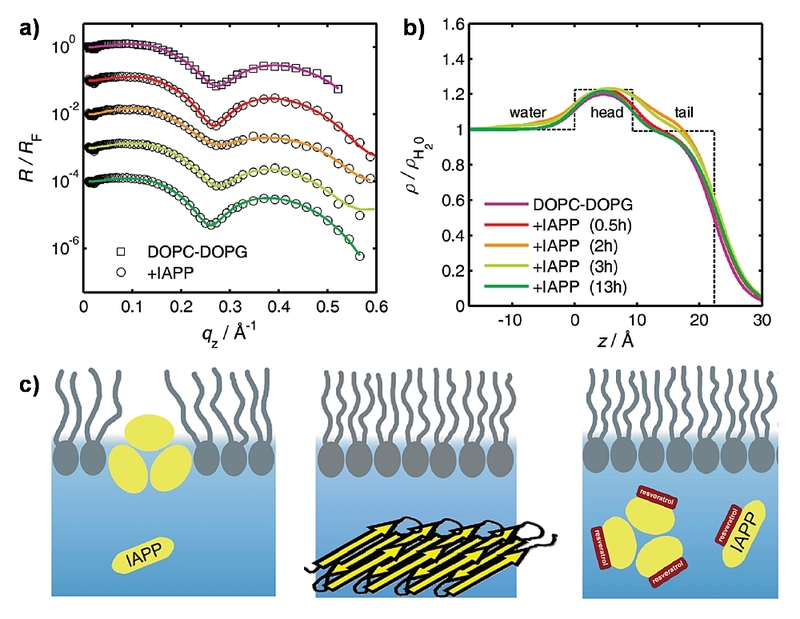 Figure 1: Interaction of IAPP with an anionic DOPC/DOPG lipid film spread at the air-water interface. (a) X-ray reflectivity data normalized to the Fresnel reflectivity at different times. (b) Corresponding electron density profiles indicate marked IAPP-induced changes in the intermediate time range. (c) Schematic illustration of lipid-induced aggregation of IAPP and its inhibition by resveratrol. IAPP adsorbs and oligomerizes at the anionic lipid inter faces and, eventually, larger aggregate structures detach from the lipid interface. In the presence of resveratrol at stoichiometric concentrations, the inter action of IAPP with anionic lipid films is blocked. Figure 2: Inhibitory effect of resveratrol in bulk solution (a,b) and in the presence of lipid interfaces (c,d) as observed by atomic force microscopy. (a) IAPP without resveratrol and (b) 10 μM IAPP in the presence of 10 μM resveratrol (height scale: 0-5 nm). (c) No IAPP aggregation is observed in the presence of a neutral, zwitterionic DOPC monolayer. (d) A similar IAPP morphology is encountered in the presence of aggregation-fostering anionic DOPC/DOPG monolayer when stoichiometric concentrations of resveratrol were added (height scale: 0-1 nm; scale bar: 300 nm). Published as: “Elucidating the Mechanism of Lipid Membrane-Induced IAPP Fibrillogenesis and Its Inhibition by the Red Wine Compound Resveratrol: A Synchrotron X-ray Reflectivity Study”, J. Am. Chem. Soc. 131, 9516-9521 (2009). The islet amyloid polypeptide (IAPP) or amylin plays a major role in the pathogenesis of type-II diabetes mellitus (T2DM). Using X-ray reflectivity, atomic force microscopy and infrared spectroscopy in concert, we obtained a molecular picture of how lipid interfaces trigger the fibrillation process and how fibrillation can be inhibited by small-molecule inhibitors such as the red wine compound resveratrol. Inside a biological cell, protein folding into the biochemically functional form results from highly regulated processes. Given certain conditions, ordered assemblies of (partially) unfolded monomers or protein fragments may be formed, such as cross ß-sheet rich structures called amyloid fibrils [1,2]. Protein aggregation and subsequent amyloid formation of proteins, such as Aβ, islet amyloid polypeptide (IAPP), prion protein and α-synuclein, is linked to the pathogenesis of many incurable human diseases, including Alzheimer’s and Parkinson’s disease, transmissible spongiform encephalopathies and type-II diabetes mellitus (T2DM). IAPP or amylin is a 37 amino acid residue peptide hormone that is synthesized by ß-cells of the pancreatic islets of Langerhans. Naturally, it is involved in controlling the level of glucose in the blood. However, IAPP has also been found to be the main component of the extracellular amyloid plaques involved in T2DM. The mechanism ruling fibril formation of IAPP that triggers its conversion from a functional monomer into insoluble amyloid fibrils is still not well understood. Recent studies  have shown that the interaction of IAPP with lipid membranes may induce fibril formation. Despite the efforts toward a biophysical characterization of the different states of aggregation [3,4], the lack of structural information still impedes a detailed molecular understanding of IAPP fibrillogenesis. In this study, synchrotron X-ray reflectivity, atomic force microscopy and ATR-FTIR spectroscopy were applied in order to explore the mechanism of how lipid interfaces influence IAPP fibrillogenesis and how this may be inhibited. X-ray reflectivity measurements were performed using the liquid surface scattering set-up of beamline BW1 at HASYLAB. In order to mimic the conditions present in a biological cell, we spread a mixture of neutral, zwitterionic DOPC and anionic DOPG on a Langmuir trough and compressed the lipid film to a physiological surface pressure of 30 mN/m. Figure 1 shows the X-ray reflectivity data of the DOPC/DOPG lipid film in the presence of IAPP. Distinct IAPP-induced changes are observed in the intermediate time range indicating insertion of IAPP into the lipid’s upper chain region. IAPP oligomers with a maximum size of 20 Å are formed in the lipid monolayer leading to an increase in electron density. Together with the AFM and ATR-FTIR data, the following scenario of IAPP fibril formation in the presence of anionic lipid interfaces could be deduced: Lipid-induced fibrillation of IAPP is initiated by lipid-induced nucleation, oligomerization, followed by detachment of larger IAPP aggregate structures from the lipid membrane, and terminated by the formation of mature fibrils in the bulk solution (Fig. 1c). Inhibiting amyloid fibril formation is regarded as a potentially key therapeutic approach toward amyloid-related diseases [1,2,5,6]. Here, we used the phenolic red wine compound resveratrol which is known for its inhibitory effect on Aß fibrillogenesis (the Alzheimer peptide) as a potential inhibitor for IAPP fibrillogenesis. The potential of resveratrol to inhibit IAPP fibril formation in bulk solution is revealed from the AFM data shown in Figure 2. Furthermore, resveratrol is able to block IAPP- lipid membrane interactions and thus to inhibit IAPP aggregation also in the presence of aggregation-fostering negatively charged lipid interfaces. Inhibition takes place during the very early stages of the fibrillogenesis and is efficient already at stoichio metric concentrations of resveratrol and IAPP. Only very small IAPP particles, probably consisting of non-reactive resveratrol/ IAPP complexes, are found in the bulk phase. In the presence of resveratrol, the N-terminus of IAPP is masked hindering IAPP-lipid interactions. 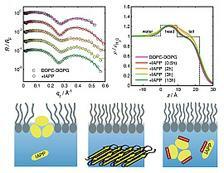 In conclusion, first X-ray reflectivity studies on IAPP at lipid interfaces have been carried out. Together with atomic force microscopy and infrared spectroscopy, these measurements provide a molecular picture of the time-dependent scenario occurring upon aggregation of IAPP at anionic lipid interfaces. Moreover, the inhibitory potential of the polyphenolic red wine compound resveratrol on IAPP aggregation also in the presence of aggregation-fostering negatively charged lipid interfaces is demonstrated. Meanwhile it has been shown by cellular studies that this polyphenolic compound is also able to arrest IAPP fibril formation at an early stage in vivo . F. Chiti, C. M. Dobson, "Protein misfolding, functional amyloid, and human disease", Annu. Rev. Biochem. 75, 333-366 (2006). F. E. Cohen, J. W. Kelly, "Therapeutic approaches to protein-misfolding diseases", Nature 426, 905-909 (2003). D. H. J. Lopes, A. Meister, A. Gohlke, A. Hauser, A. Blume, R. Winter, "Mechanism of islet amyloid polypeptide fibrillation at lipid interfaces studied by infrared reflection absorption spectroscopy", Biophys. J. 93, 3132-3141 (2007). C. Jeworrek, O. Hollmann, R. Steitz, R. Winter, C. Czeslik, "Interaction of IAPP and Insulin with Model Interfaces Studied Using Neutron Reflectometry", Biophys. J. 96, 1115-1123 (2009). R. Mishra, B. Bulic, D. Sellin, S. Jha, H. Waldmann, R. Winter, "Smallmolecule inhibitors of islet amyloid polypeptide fibril formation", Angew. Chem. Int. Ed. 47, 4679-4682 (2008). R. Mishra, D. Sellin, D. Radovan, A. Gohlke, R. Winter, "Inhibiting Islet Amyloid Polypeptide Fibril Formation by the Red Wine Compound Resveratrol", ChemBioChem 10, 445-449 (2009). D. Radovan, N. Opitz, R. Winter, "Fluorescence microscopy studies on islet amyloid polypeptide fibrillation at heterogeneous and cellular mem - brane interfaces and its inhibition by resveratrol", FEBS Letters 583, 1439-1445 (2009).